The Island Jar is a whole food market and café located on the main street in downtown Little Current, on Manitoulin Island, Ontario. 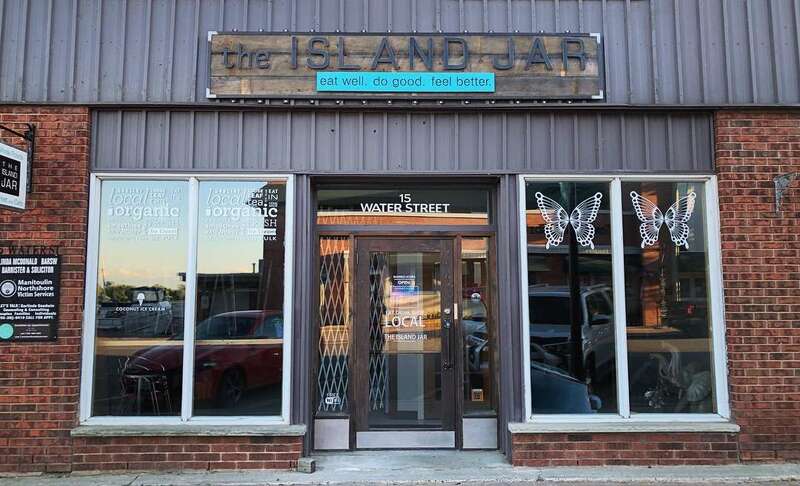 In support of local farmers and entrepreneurs, the Island Jar sells meat and produce, local art, skin care products and other goods that align with the mission of the store - eat well. do good. feel better. The Island Jar also sell natural food products (e.g. organic groceries, vegan/gluten-free ingredients etc. ), vitamins and supplements, natural cosmetics and self-care products, bulk herbs and spices, and eco-friendly products. Food service includes healthy lunch, snack and beverage options that cater to health-conscious consumers - especially those looking for vegan/gluten-free options or those with other food sensitivities/allergies. For more information about our Food Menu, click here. For more information about our Goods and Groceries, click here. For more information about our Yoga Classes and Events, click here.